Edna Schafer didn’t so much battle cancer. She proved that love and joy outshine it. 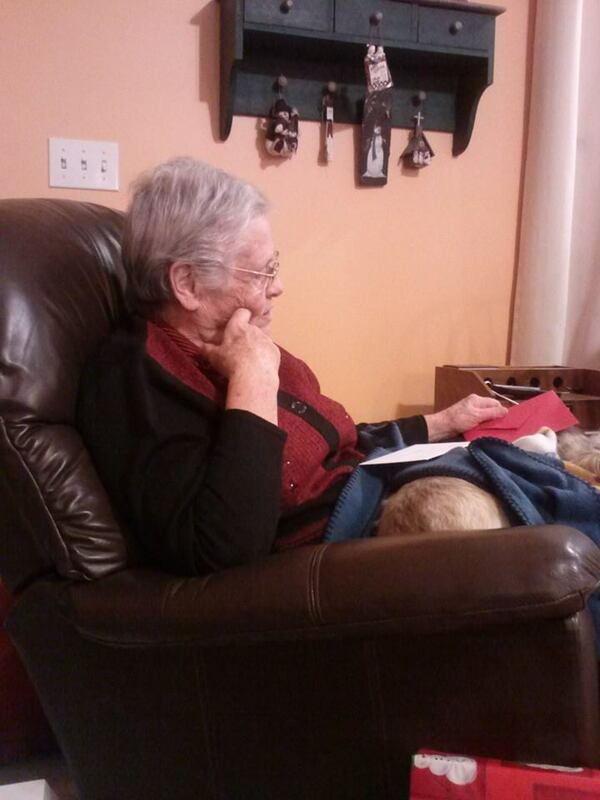 My Aunt Edna, who died last week, had known much pain and grief in her 76 years of life. The mother of seven children, she and husband, Bob, a rough-talking farmer, earned reverence in the eyes of their family and neighbors for their hard work, integrity and kindness. As years passed respect has only grown for a family and its country matriarch who have endured unimaginable grief with grace and acceptance. When cancer was discovered in Edna ‘s bladder four years ago, few doubted that this indestructible woman would beat it. A year later doctors removed her kidney. Posts on a Facebook page called “Edna’s Posse” remained as optimistic as ever. In the middle of chemotherapy treatments Edna suffered a heart attack. She joked about her bad luck and was always the first one to laugh. She never wavered from hospitality. Edna nurtured her children, grandchildren, nieces and nephews. She seemed ageless as doctors injected needles of chemotherapy and constantly checked her blood. When she underwent triple bypass surgery she found it more ironic than crushing. Even in the hardest of times guests to her house were offered cookies, ice cream or a big spread of home cooking. A favorite memory of nieces and nephews was wrapping up in blankets and sleeping bags for overnights on the living room floor of the big old farmhouse straight out of rural mythology. If we weren’t all old now we’d still be camping out at Edna’s. One of the first times I ever got drunk, my cousins brought me back to pass out on the Schafer fold-out couch. I feared disapproval the next day at lunch, but only got the infectious laugh from my aunt. She ribbed me later at family reunions for refusing her fresh strawberries that day as I struggled through a strawberry schnapps hangover. The Schafer family’s suffering was like a chapter from the Book of Job. When doctors discovered a tumor on the trachea of Bob and Edna’s youngest daughter Anita, a kindergartener at the time, she was given 6 to 9 months to live. She lived eight years symptom free. In 1981, Anita would be unexpectedly diagnosed with brain tumors. She would spend much of the next year and a half in hospitals as doctors tried to save her. The countryside wept with the Schafers when Anita died two days before her 14th birthday. The Schafer family gathered around their mom, front and center. There were whispers that this family seemed cursed when in fact they were blessed. Rather than break apart in the shadow of grief, they gathered around their mother and thrived. Laughter was a constant in a family of good humor. Affection was sown in a family that knew great loss. 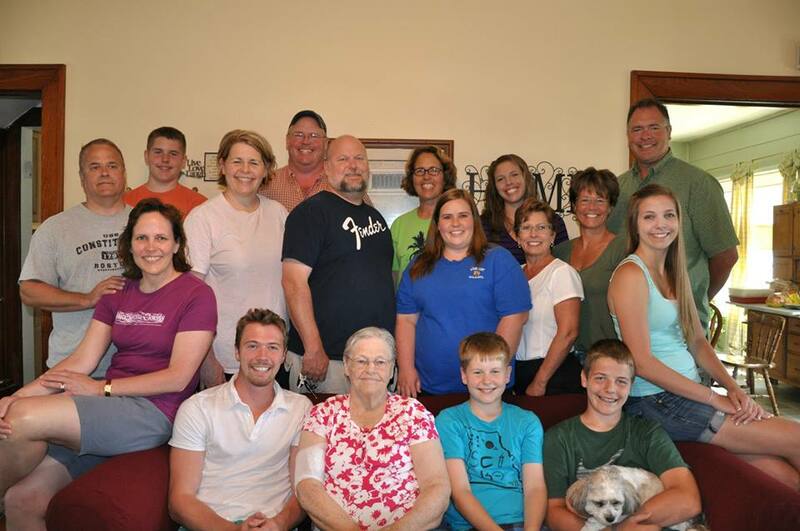 My brother and I often noted that the Schafers always had the best turnout at family reunions. Of course there were lines of sorrow in Aunt Edna’s face. But they were inseparable from the lines of laughter. Eventually the cancer spread to Edna’s liver, lymph nodes and abdominal wall. Weakened in the last year of life, she still traveled with her daughter Lori to Maine. Then in August she made the long journey to Idaho to see her granddaughter married. Edna returned home. Hospice came to keep her comfortable in her final days. But I believe a life well lived was her greatest comfort. 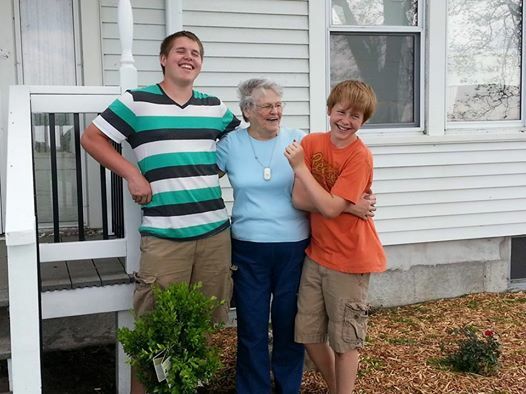 Edna shares a laugh with her grandsons, Garrett (left) and Ethan. “I think Mom knew she was going to die from the beginning, but she was protecting us,” Sharon said. People were always drawn to Edna. Not for great words or great deeds, but rather for simple acts of kindness and her ability to find joy through trials that many feared would break them. She knitted scarfs, and eagerly gave them to her grandchildren or any children who came to visit. Every time I talked with her, the first thing she said was, “Come see me.” On one of my visits back to Missouri Edna opened her house to my children and me to spend a weekend together. She immediately became Aunt Edna to them as well. In her final hours people filed through her house to say their goodbyes and more goodbyes were said in a crowded church at her funeral. Edna grieved deeply. Then scattered joy like seeds on rich soil. She taught those who knew her that life is suffering. But we are meant for joy.